A new study from the University of Washington shows whether mammals in the Western Hemisphere will actually be able to move to new areas suitable for them when they are displaced by climate change. Results of the study show that carnivores like coyotes and wolves are likely to do okay, while many other species won’t be able to expand into new areas fast enough. A safe haven could be out of reach for 9 percent of the Western Hemisphere’s mammals, and as much as 40 percent in certain regions, because the animals just won’t move swiftly enough to outpace climate change. “We underestimate the vulnerability of mammals to climate change when we look at projections of areas with suitable climate but we don’t also include the ability of mammals to move, or disperse, to the new areas,” Schloss said. Indeed, more than half of the species scientists have in the past projected could expand their ranges in the face of climate change will, instead, see their ranges contract because the animals won’t be able to expand into new areas fast enough, said co-author Joshua Lawler, UW associate professor of environmental and forest sciences. In particular, many of the hemisphere’s species of primates – including tamarins, spider monkeys, marmosets and howler monkeys, some of which are already considered threatened or endangered – will be hard-pressed to outpace climate change, as are the group of species that includes shrews and moles. Winners of the climate change race are likely to come from carnivores like coyotes and wolves, the group that includes deer and caribou, and one that includes armadillos and anteaters. 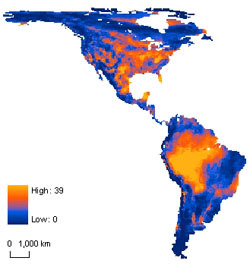 To determine how quickly species must move to new ranges to outpace climate change, UW researchers used previous work by Lawler that reveals areas with climates needed by each species, along with how fast climate change might occur based on 10 global climate models and a mid-high greenhouse gas emission scenario developed by the U.N. Intergovernmental Panel on Climate Change. It’s understandable, for example, that a mouse might not get too far because of its size. But if there are many generations born each a year, then that mouse is on the move regularly compared to a mammal that stays several years with its parents in one place before being old enough to reproduce and strike out for new territory. Western Hemisphere primates, for example, take several years before they are sexually mature. That contributes to their low-dispersal rate and is one reason they look especially vulnerable to climate change, Schloss said. Another reason is that the territory with suitable climate is expected to shrink and to reach the new areas animals in the tropics must generally go farther than in mountainous regions, where animals can more quickly move to a different elevation and a climate that suits them. Those factors mean that nearly all the hemisphere’s primates will experience severe reductions in their ranges, Schloss said, on average about 75 percent. At the same time species with high dispersal rates that face slower-paced climate change are expected to expand their ranges. “Our figures are a fairly conservative – even optimistic – view of what could happen because our approach assumes that animals always go in the direction needed to avoid climate change and at the maximum rate possible for them,” Lawler said. The researchers were also conservative, he said, in taking into account human-made obstacles such as cities and crop lands that animals encounter. For the overall analysis they used a previously developed formula of “average human influence” that highlights regions where animals are likely to encounter intense human development. It doesn’t take into account transit time if animals must go completely around human-dominated landscapes. “I think it’s important to point out that in the past when climates have changed – between glacial and interglacial periods when species ranges contracted and expanded – the landscape wasn’t covered with agricultural fields, four-lane highways and parking lots, so species could move much more freely across the landscape,” Lawler said. The third co-author of the paper is Tristan Nuñez, now at University of California, Berkeley. Both Schloss and Nuñez worked with Lawler while earning their master’s degrees. Lawler did this work with support from the UW School of Environmental and Forest Sciences using, in part, models he previously developed with funding from the Nature Conservancy and the Cedar Tree Foundation. 3 Comments on "Many Mammals in Western Hemisphere are Unlikely to Outrun Climate Change"
What the article does not seem to cover (and the study may have) is the impact to habitat. Animals may be able to ‘move’ but that does not mean their food will move with them. As people are well aware, some animals have very specific dietary needs that go with where they live. I wonder if this study does take this into account. If it does not than I am positive the impact would be much greater. We can only hope right?